The progress of the 1914-1918 Great War has been closely followed in the UK over the past four years. Radio and TV programmes, and major events have ensured we could not forget the dreadful events of 100 years ago. 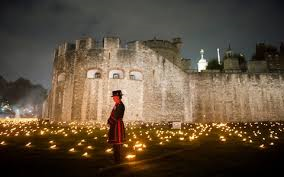 In 2014 the poppy installation Blood Swept Lands and Seas of Red marked the outbreak of war and in 2018 Beyond the Deepening Shadow, in which thousands of torches are lit in remembrance of the armistice, has captured the public’s imagination. While the focus has been on London, parts of the poppy display have been seen around the country, and on 11 November 2018 villages, towns and cities will hold services at their war memorials mirroring those at the cenotaph in London’s Whitehall. In Stratford-upon-Avon during the morning bells will ring out, a red light will be lit on the RST’s tower and a civic procession will be held followed by wreath-laying. 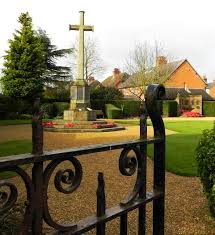 During the evening a beacon will be lit in the town’s Garden of Remembrance. The final event will be, perhaps inevitably, a series of performances of Shakespeare’s Henry V in an acclaimed production by Antic Disposition to take place at Holy Trinity from 12-16 November. The production includes original songs inspired by the poetry of A E Housman, shifting between 1415 and 1915 to create a tribute to the soldiers in conflicts centuries apart. Some tickets are still available and more information is to be found here. I’ve written before about Shakespeare in World War 1, here looking at the stained glass panels in the Shakespeare Memorial Theatre, and here looking at how the war directly affected townspeople. What has been striking is the amount of documentary evidence that tells the stories of ordinary soldiers. While most never spoke of their experiences, many wrote things down. Diaries, letters, memoirs, provide harrowing testimonies that complement the still and moving images and the bald reports that appeared in newspapers. This website includes a section on Memoirs and Diaries as well as published Poetry and Prose. It’s a sad coincidence that the generation who went off to fight were also some of the first to benefit from universal free primary education and the creation of Local Education Authorities under which schools were funded from local taxation. This ensured that from the beginning of the twentieth century literacy became almost universal. The soldiers at the front could write their own letters home and record their own daily struggles. 5.7 million British soldiers were issued with a New Testament. There’s an account here, on the Australian Bible Museum’s site, of how, on the first day of the Battle of the Somme, in which 60,000 British troops were killed or wounded, many bodies were found with their bibles in their hands. As they lay dying, soldiers brought the book out from their breast pockets to gain some comfort from their words. Shakespeare too was expected to provide solace for soldiers who had been severely injured. The Lord Kitchener Memorial Fund provided these men with a copy of Shakespeare’s works, “a source of pride and satisfaction, …of genuine and personal solace”. In Stratford in September 1918, 41 disabled men were presented with these volumes. It’s impossible to know what they made of the gift. If they were to read even Henry V, the most jingoistic of the plays, they would have found uncertainty. In his discussion with Williams and Bates in the “night scene”, the disguised king hears the voices of the ordinary soldiers, their fears and questioning of the actions of their leaders. These same feelings have surely been felt by soldiers in every conflict around the world. Williams. That’s more than we know. well that die in a battle. This entry was posted in Legacy, Stratford-upon-Avon and tagged Antic Disposition, Armistice, Australian Bible Museum, Beyond the Deepening Shadow, Blood Swept Lands and Seas of Red, Henry V, Lord Kitchener, Tower of London, World War 1. Bookmark the permalink.